This is my family's house. 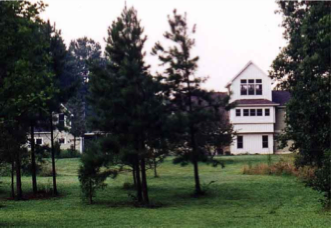 We designed and built our home in 1997 with a passive solar orientation, a thermal mass finished concrete floor and a ventilation tower as integral parts of the passive heating/cooling system, and plentiful controlled daylight. Over the years we added the solar hot water system, an ornamental pond, and countless foster pets (including several who stayed permanently!). It's become a wonderful, comfortable place to live that uses dramatically less energy than a typical comparably sized house.